For years, the iconic Tower Life Building has been a recognized landmark located in the heart of Downtown San Antonio. In 1950, the original 100-foot flagpole was removed and replaced with an antenna in order to allow the city's second Television station to broadcast from inside the building. The cost of the conversion was estimated to be around two million dollars. Unfortunately, in 2006 the building endured a fire while some work was being done to the base of the antenna. As a result, the antenna was removed and replaced with another rooftop flagpole similar to the original. The lantern at the top of the building along with the stars and stripes are illuminated throughout the night hours and can be seen from miles away. Every year as summer comes to a close, I end up in Chicago to witness the spectacular Chicago Air and Water Show which showcases some of the finest acrobatics in Aviation known to mankind. Unfortunately, mother nature was unwilling to cooperate this year causing the show to be dramatically downsized and limited to one day. Later that evening I ventured around the city to capture some photos of the vibrant city scene. After visiting numerous attractions throughout city while enduring a constant light rain, I headed back to my hotel via the world famous Michigan Avenue. With the addition of the nameplate being added to Trump tower, it was now possible to capture a small portion of the landmark while still remaining recognizable to most people who do not frequent Chicago. I positioned myself on a bridge noticing the famed Wrigley building in background and composed the image capturing both landmarks. As a light mist continued to fall, I incessantly wiped the lens clean as I waited for a bus to enter the scene in order to provide the broad light trails for an extra emphasis to the photo. A four second exposure proved to be ideal to capture the scene - good thing- since I waited another 20 minutes and witness very little traffic. This just goes to show that timing is critical and half the battle is simply being in the right place at the right time. The Detroit Opera House is an ornate building located in downtown Detroit within the Grand Circus Park Historic District. This building serves as home to the Michigan Opera Theatre as well as numerous other events. The theatre was originally designed by C. Howard Crane who also designed the Fox Theatre, The Fillmore Detroit as well as the Detroit Symphony Orchestra Hall. The original construction was completed in 1922 with an extensive renovation completed in 1996 to bring the building up to today's standards. The building was originally known as the Capital Theater which at the time was the fifth largest of its kind in the entire world. The theater was constructed with outstanding acoustics while assuming the style of the Grand European Opera houses. The Capital theater was decorated in the Italian Renaissance style with lavish crystal chandeliers, frescoes, marble staircases ,and brass fixtures. Rich rose-red Italian damask was used for the mainstage curtain as well as draperies throughout the house. The majority of these features are still present in the renovated version of the Detroit Opera House. The Capitol Theater was renamed the Paramount Theater in 1934 and went on to host such luminaries as Duke Ellington, Louis Armstrong, Will Rogers as well as volumes of rock stars of the 1950's. After decaying for several years, the theater was repaired and renamed the Grand Circus Theater in 1960 while transforming itself into a movie house. The theater provided a plethora of musical acts such as Ray Charles and Roy Orbison. The palace closed in 1985 after a small fire. After being neglected and abandoned for years, the Detroit Opera House was successfully restored in 1996 while assuming the current name with the oversight of the Michigan Opera Theater. While being home to the Michigan Opera Theater, the Opera House also plays host to some of the world's greatest dance companies. A special Thanks goes out to Alanna St. Laurent for arranging the private tour to make this experience possible. During the past few years the Detroit Zoo has put on an massive exhibition of LED lights throughout the Holiday season to provide a rather unique experience known as Wild Lights. More than five million LED lights are used to illuminate various trees, buildings and animal sculptures. While enjoying the light show, there was also a treat waiting in the picture above. An exhibition showcased the best wildlife photographs of the year submitted from photographers all over the world - some of these images were absolutely breathtaking. The Arctic Circle area was represented by a couple of towering Polar Bears greeting the visitors. This is a great event for the entire family and especially children. There is a smores station setup to create your own campfire treat along with numerous refreshments an ice carving station (weather permitting). All in all this is definitely something worth seeing. The vibrant illumination definitely provides a new perspective to the Zoo. The only downside for photographers is the fact that the zoo does not open during the event until after complete darkness has arrived thereby eliminating the chance of stunning blue hour photos. As the thermometer begins to dip here in the midwest, I can't help but reminisce about some time I spent last summer on Mackinaw Island, Michigan at the famed Grand Hotel. The famous historic landmark is located on a small island between the Upper and Lower Peninsulas. The hotel has been frequented by past presidents, luminaries, dignitaries, and celebrities alike. The hotel has taken some flack for charging visitors a $10 fee for visiting the property. The Grand Hotel contains the longest porch in world measuring approximately 660 feet in length while overlooking an expansive tea garden. The porch area hosts vacationers, concertgoers, along with the those attending the Annual Mackinac Policy Conference. As you make your way through the main corridor and up a few stairs you end up at the main level of the hotel containing restaurants, bars and numerous seating areas. Once at the crossroads, you see my personal favorite, the Audubon Wine Bar to the right, a luxuriously comfortable seating area straight ahead and more seating areas to the left for everyday conversation. The Audubon Wine Bar provides a relaxing atmosphere to enjoy the finest wines from Napa Valley, the greatest cognacs from France along with the finest single malt scotches from Scotland. The plethora of wall to wall books provides a very comfortable clubby feel without the usual ostentatiousness accompanying watering holes of this magnitude. One final note, this place serves the best Truffle fries in the entires state, if not, the country. Do not leave without sampling these culinary delights. As you leave the bar after ingesting your favorite cocktails, a short walk out the door leads you to another area for the ultimate relaxation. Enormous, plush couches await adorned with priceless chandeliers above. The final destination on this wonderful journey through the Grand Hotel takes us to the top floor to the Cupola Bar which provides breathtaking panoramic views of the Straits of Mackinac. As is the case throughout the hotel, the customer service is second to none and the worn "no" is non-existent. This is a definite stop while visiting the hotel and will provide memories that last a lifetime. I am already anticipating my return visit next spring. Last weekend I decided at the last minute to getaway for a night absolving myself from the responsibilities and obligations of everyday life. I jumped in the car and headed to Grand Rapids, Michigan which has quickly become one of the fastest growing cities with it's enticing offering of breweries, restaurants and a vibrant art scene. Located in the heart of downtown lies the iconic pedestrian bridge simply known as the Blue Bridge. The bridge connects the city center on the East bank to the Grand Rapids Public Museum and Grand Valley State University facilities on the West. This pedestrian bridge provides a convenient connection between the Robert C. Pew Grand Rapids Campus of Grand Valley State University as well as the Grand Rapids Public Museum and other attractions on the east side of the river. This location has proven quite popular while providing a backdrop for wedding parties, prom pictures with its unmistakeable "Lake Blue" color. Off to the left, in the two previous photos, is the JW Marriott Hotel where I spent the evening. Excellent service and attention to detail provide the perfect complement to the eye-catching contemporary architectural design. The downtown area is an ideal venue for taking in the all glorious options a large vibrant city has to offer. There are walking paths along the water which allow you to experience big-city excitement without the usual big city hassles. There are multiple dining, shopping, entertainment, and sightseeing opportunities all within a 10-minute stroll. The Grand Rapids Public Museum happens to be one of the oldest history museums in the United States. The museum contains a cafe, gift shop, as well as a rather unique feature, a 1928 Spilllman Carousel. The museum offers attractions for everyone as well as those interested in Astronomy by way of the Roger B. Chaffee Planetarium. Upon completing the museum tour, a simple stroll across the street brings you to the Gerald R. Ford Museum. Grand Rapids continue to flourish as one of the fastest growing cities with all its unique offerings and I look forward to returning to visit its newest attractions. The city of San Antonio, Texas is known for many things - The iconic river walk, Gigantic portions of beef, The San Antonio Spurs as well as the Famous Alamo. Among the less publicized attractions are the numerous churches located throughout the city. On a recent trip to San Antonio, I was fortunate enough to acquire access to three of the more better known churches in the city. The non-denominational Little Church of LaVillita happens to be one of San Antonio's most unique historical sites. Situated just off the river walk in the Historic Art Village of Lavillita, the Church was built in 1879 in Gothic Revival Architecture with a stunning stained glass window greeting all visitors upon entry. The meticulously crafted concrete walls provide an extremely unique experience among the churches of today while actively conducting services every Sunday Morning. The Parish of Saint Joseph was the brainchild of a group of German Catholic immigrants searching for a place of worship in the mid 1800's. The church was constructed in a rather spartan fashion with small additions being made as funds allowed by the community. The exterior structure was finally considered completed in 1898 when a steeple was added to the gothic style rooftop. In 1902, the church was granted an immense upgrade as a handful of beautiful stained glass windows were purchased from a glass factory in Bavaria, Germany for the sum of $3000. The resiliency of the church was tested in 1945 when Joske's department store sought to purchase the church and grounds in order to expand its operation. The parishioners voted unanimously not to sell, exhibiting tremendous faith and resolve. As a result, the church remains a symbol of faith while surrounded by the Rivercenter Mall, hotels and residences. For this reason, the church is known to locals as the "jewel in the heart of San Antonio". The church serves as a respite for many locals and tourists alike every Sunday morning. This picturesque institution requires a visit by anyone in the vicinity of San Antonio - it is definitely worth the drive. Located in Downtown San Antonio is the world famous San Fernando Cathedral which has been honored to be listed on the National Register of Historic Places. It serves as the Mother Church of the ArchDiocese of San Antonio. The original church was built between 1738 and 1750 with the original walls forming the sanctuary of the cathedral. This church has the distinction of being the oldest cathedral in the State of Texas. The Church gets its name from Ferdinand III of Castile, who was a a 13th century ruler. The Cathedral was built by settlers from the Canary Islands. Due to this effort, the interior contains a picture of the Virgin of Candelaria, the patroness of the Canary Islands. The Cathedral was enlarged in the Gothic Style in 1868, with the addition of the existing nave. The striking stained glass windows were added in 1920. San Fernando Cathedral happens to have the elite status of being the only church in all of Texas ever visited by a Pope - Pope John Paul II arrived in 1987. The cathedral serves as the foundation for religious citizens of San Antonio. Each year, countless events are held here including baptism, weddings, funerals, as well as other special activities. As the temperatures in the midwest begin to dip, I cannot help but reflect back on the warmer memories of summertime. Every August, The City of Chicago along with Shell Oil Products US hosts The Chicago Air And Water Show, which happens to be the largest free show of its kind in the entire United States. Visitors from all over the world inhabit the Windy city during this weekend to witness one of the greatest spectacles in Aviation, The infamous Blue Angels. The Blue Angels represent the some of the most highly trained pilots in the world. The commanding officer known as "Boss" must have accumulated a minimum of 3000 tactical jet flight-hours while the other members of the fleet must need a minimum of 1250 hours to be eligible for admission to this elite squadron. The Angels have an extensive travel schedule and can be seen in a city near you. I highly recommend experiencing this spectacular and invigoration display - there is simply nothing quite like it. The Aeroshell Aerobatic Team seen above has quite a following of its own. Perhaps not as famous as the Blue Angels, they are more than capable of stealing the show. 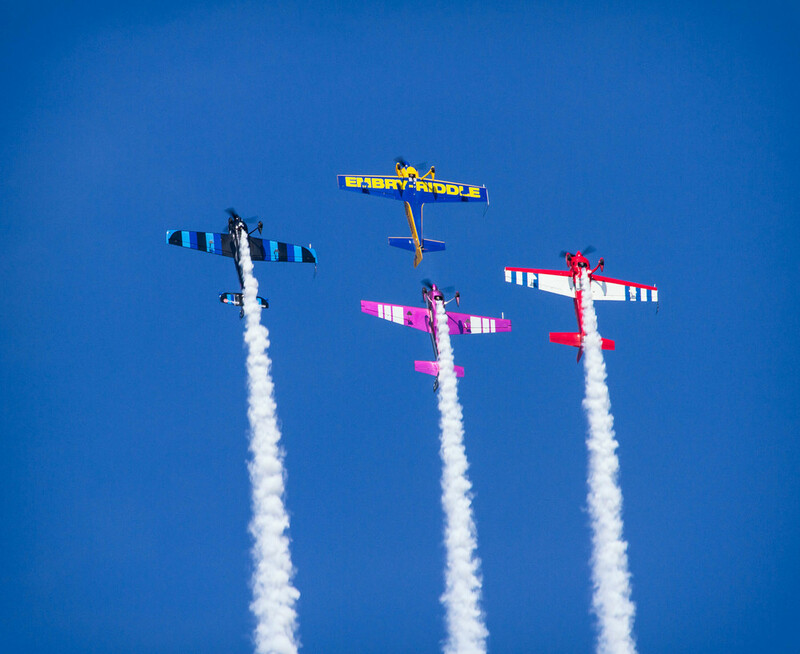 They can be seen entertaining families throughout the country on weekends and have recently been inducted into the International Council of Air Shows (ICAS) Hall of Fame. Embry-Riddle Aeronautical University was founded just two decades after the Wright Brothers history-making flight. The institution is a highly respected authority on aviation and aerospace providing education in the fields of research, marketing, engineering, manufacturing and management of modern aircraft systems. There are over 150 campus locations throughout the United States, Europe, Canada and the Middle East. The University is represented at numerous air shows throughout the world. The Chicago Airshow provides ample entertainment for young and old alike. There is no better place to spend your day on a warm summer afternoon than consuming the breezes of Lake Michigan while dipping your toes in the sand. Perched on a high bluff overlooking Lake Michigan lies the world famous Leggs Inn Restaurant which exhibits a rather unique and mysterious approach with its architecture and decor. Located in Cross Village, Michigan, this restaurant features medieval looking stone, timber and driftwood taking us back in time to an experience unlike any other. The creator, a Polish immigrant by the name of Stanley Smolak, used his love of the inhabiting Ottawa and Chippewa Indians as influence for the blend of Old World European and Indian Cultures seen throughout the interior decor. Above is the entry foyer which displays an elaborate collection of nature and hand carved furniture made of tree stumps, limbs and roots which are seen throughout multiple rooms in the restaurant. The pool room continues the theme of meticulously handcrafted wood as the mainstay of its architectural foundation. The cuisine is a balanced offering of authentic Polish and American dishes. Every dish is given the proper attention to detail to ensure an extremely enjoyable and memorable experience. In addition,the bar serves a multitude of accompanying hand crafted local beers not found at most establishments. After satisfying customers for decades, the Leggs Inn has become a world famous destination acquiring praise from countless national magazines, publications and broadcasters throughout the country. The Smolak family has gone to great lengths to enforce world-class friendly service to deliver amazing culinary delights. The waitstaff deliver the perfect combination of friendliness and attention creating a rather unique and unforgettable experience. This place has earned a guaranteed visit on my next trip to Northern Michigan. Every small town has a local establishment where residents gather for sustenance and exchange stories with friends and family. As it turns out, my neighborhood is no exception. Located in the tiny lakeside community of Union Lake, Michigan lies a restaurant which stands heads and shoulders above all in terms of overall quality and attention to detail. The restaurant, suitably named, "It's A Matter of Taste" caters to the foodies in all of us by providing fresh seafood, pasta and steak of the highest quality around. After frequenting this restaurant countless times, the level of consistency is absolutely astounding. The waitstaff is always extremely attentive and pleasant providing just the right amount of supervision to ensure a delightful dining experience. The menu changes periodically with the seasons to ensure the freshest ingredients are utilized. Since the restaurant backs up to a residential lake, the summertime provides a refreshing and memorable outdoor dining experience assuming you have secured a reservations several days in advance. This is absolutely and unequivocally the finest eatery in the area and cannot be missed while visiting the area. As a frequent visitor to the ever popular city of Grand Rapids, Michigan, one attraction which cannot be missed is the famous Frederick Meijer Gardens. The area host numerous exhibitions, concerts, and events for members of the entire family to enjoy. One specific item of note are the various installations (sculptures) positioned throughout the Gardens which are substituted on a regular basis. This frighteningly realistic masterpiece was created by one of the most innovative figurative sculptors working today, Sean Henry. His trademark happens to be creating realistic models in contemporary clothing scaled either much larger or smaller than life-size. He utilizes drawings and clay models that are then meticulously converted into bronze. Fans of science would appreciate the sculpture known as "Neuron" by Roxy Paine. This sculpture is a compilation of 3500 stainless steel rods and pipes representing the ultimate transformation from industrial to art. Deborah Butterfield's work deals intricately with horses and portraying them as intelligent mares rather than the customary war horse. The name Cabin Creek comes from the location where the wood for this sculpture was compiled. The wood is eventually transformed into bronze suitable for the elements of the Midwest. As with many gardens around the country, there is always a place of serenity allowing for solitude and contemplation. Alexander Liberman was showered with critical acclaim for his paintings, photographs and sculptures. This sculpture named Aria, which is a melody sung by one voice, towers at 42 feet enabling viewers to walk around and through the work. Aria clearly demonstrates the artist’s fondness for architecture and music. The final sculpture of the day comes from Jaume Plensa known as "I, you, she or he… The artist uses language and communication as theme for his installations. The three sculptures, whose bodies are comprised of mainly stainless steel letters, are all seated on boulders facing each other, faceless, in silent conversation. The artist is better known for his famous Crown Fountain installation in Millennium Park in downtown Chicago. I look forward to returning to the Gardens as there is a major expansion underway for an authentic Japanese Garden to be constructed on the property by the summer of 2015 with a Koi pond and all. A while back I was given the opportunity to photograph the beautiful Christ Church Cranbrook in the affluent community of Bloomfield Hills, MI. I was fortunate to be a group of about 18 photographers who had the church to ourselves for a couple hours on a Saturday afternoon. The Church was the creation of newspaper magnate George G. Booth and his wife, Ellen who purchased a 175-acre farm in Bloomfield Hills, Michigan back in 1904. They proceeded to construct a series of buildings including an elementary school in the community in the early twenties. Mr. Booth noticed that many residents were traveling to other neighborhoods to fulfill their worshipping needs, so he built this Episcopalian Church to serve the community of Cranbrook. The attention to architectural detail is a direct reflection of artistic spirit and inspiration which enriched the lives of George and Ellen Booth. The Church opened its doors to the community in 1928 and has flourished by serving approximately 900 families while also providing great educational and outreach opportunities to those in need. A bird's eye view of the Church from the existing and compact rear balcony. The church is famous for it's intricate woodcarvings, impressive pipe organ, as well as it's numerous stained glass windows. The best view in the house. The exquisite stained glass windows are seen throughout and captured in virtually every photograph taken of this wonderful institution. A closer view of the front of the church provides greater appreciation of the thoughtful design and planning that went it to the exhaustive construction and meticulous attention to detail. The Church was granted the coveted designation of becoming a National Historic Landmark in 1989 which can be seen just outside the entrance. I had a wonderful time visiting this tremendous institution and I would like to thank our tour guide, Peggy, for her amazing insight and hospitality she providing throughout the afternoon. This is a place you must visit if you get the chance - I look forward to return visit.